Mountaineering Scotland and the Outdoor Access Trust for Scotland (OATS) are leading a campaign to raise £100,000 to support two essential Scottish mountain path projects – joined by Walkhighlands as offical media partner. The path restoration projects are one in each of Scotland’s two National Parks, and are part of a GB-wide initiative, Mend Our Mountains: Make One Million, coordinated by the British Mountaineering Council (BMC) in collaboration with 15 National Parks. Sponsorship is provided by Cotswold Outdoor and Snow+Rock, two of Britain’s leading outdoor retailers. In Scotland, the first target is one of the nation’s most heavily eroded mountain paths, a highly visible scar up the slopes of Beinn a’ Ghlo, the great three-Munro massif in the south of the Cairngorms National Park. 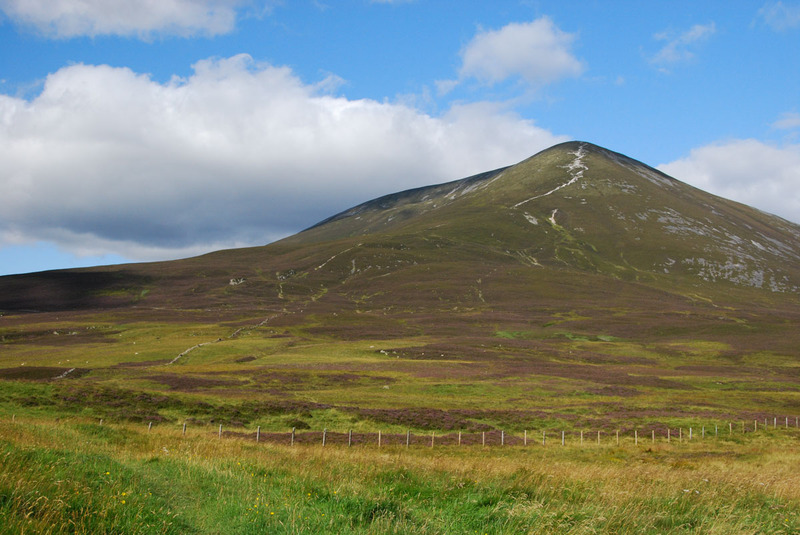 The campaign aims to raise £60,000 for this project, which will sustainably and sensitively restore the route up Carn Liath, which is currently so wide it is visible from several kilometers away on the A9 road north of Blair Atholl. The second target is urgent path repair work on the popular Arrochar Alps peak, Ben Vane, in the Loch Lomond and the Trossachs National Park. Despite claiming Munro status by a mere two feet, Ben Vane’s location within an hour or so of Glasgow has made it one of Scotland’s most popular mountain walks. £40,000 is required to create a long-lasting route up this well-trodden if steep mountain, whose path experiences significant damage, particularly in wet weather. In a recent survey of Mountaineering Scotland’s members’ views on mountain access and conservation, respondents placed a high value on the condition of mountain paths, with fundraising for restoration, repairs and maintenance of hill access being rated as one of the organisation’s top priorities. In joining forces with OATS and the BMC on the Mend Our Mountains: Make One Million campaign, Mountaineering Scotland hopes to give hillwalkers and climbers the opportunity to put their money where their mouth is. Both the Scottish fundraising targets are also part of the ‘The Mountains & The People’ project, which represents the coming together of Scotland’s two National Parks to work on access improvements at a scale never previously attempted. It is a partnership led by the Outdoor Access Trust for Scotland (OATS) in conjunction with Loch Lomond & The Trossachs National Park Authority, Cairngorms National Park Authority, Scottish Natural Heritage, Forestry Commission Scotland and the Heritage Lottery Fund (HLF). Walkhighlands, the busiest walking website in the UK, has become the official media partner for the Mend our Mountains: Make a Million campaign in Scotland. Mend Our Mountains: Make a Million will run over a whole year. It will employ a wide range of fundraising techniques, harnessing the generosity of ‘ordinary’ outdoor enthusiasts via online donations, crowd-funding and events, alongside seeking support from large businesses, corporate donors and charitable foundations. The campaign kicks off with a reception at the Houses of Parliament in London, on Monday 20 November, seeking to raise awareness among decision makers at Westminster. People can keep track of the project in Scotland through the Mountaineering Scotland website.